rehab centers,birthing centers and hospitals. The first hybrid gel polish to hit the market and set the trend for long lasting shine and durability in a polish. 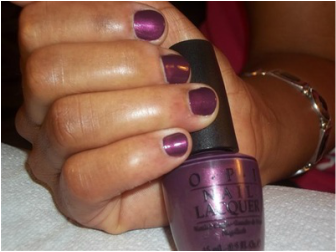 This polish is a girls best friend and will take you from week to week with no chipping or smudges. Try it and you will love it! Lasts' up to two weeks. 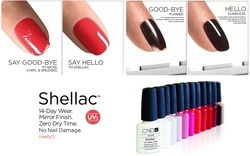 This service is perfect for both Men and Women who are looking for a classic nail service. Your professional Nail Tech will shape, buff, and file your nails to perfection. Any excess cuticle will be gently removed, if needed. This service is perfect for both Men and Women who are looking for a clean and classic pedicure service. Your professional Pedicurist will soak your feet in a warm and soothing mineral foot bath to cleanse and sanitize the feet, followed by shaping,filing and buffing of the toenails and foot massage. Attention and detail to the cuticle area will be taken care of and a callus treatment will be included for those who need "extra" care for those rough areas. For added pleasure our signature Peppermint and Vanilla Pedicure Scrub will be applied to help further exfoliate and refresh your feet for the ultimate experience in foot pampering. Polish or Buff included or simply go bare! Are you a trend setter and fashion forward? If so, we have the perfect touch to natural nails with our Minx Nail Service for both Men and Women. Minx carries an array of pretty cool nail templates in great designs catered for the Man or Woman. Minx is put on to freshly Manicured Nails or a Pedicure and will last up to two weeks. If you are looking for something FUN or for that special occasion...this service is what you need! The pedicure refresher is for clients who are in between their monthly pedicure service and don't quite need the full service right now, but looking for that ultimate pedicure feeling that you get right after you receive a fresh pedicure. With this service you will receive a mineral bath foot soak, a foot mask for hydration, a pedicure scrub applied for exfoliation and callus care for the heels if needed. Polish is provided, by request. Silk Wraps/Fiber Glass Nails is a classic service in the nail industry. Fiber Glass Nails are great for mending nail repairs and for applying to natural nails or tips for length. This type of nail service is lightweight and not recommended for people that work with or use their hands often and need durability. However, if you need a break from acrylics or hard gel nails and looking for a healthy alternative or if you need your nails to look great for a special event or occasion this service may be just what you are looking for. Reconstructed Toenails Using Acrylic or Gel Nail Application as the base. This service is used to add width and Length to compromised toenails. ​Have you ever had toenails that were cut extremely too low or maybe a prior toenail injury has caused your toenail to grow against it's natural growth pattern? There is hope. A reconstructed toenail can be shaped onto your existing intact nail bed to create a healthy natural looking nail using gel or acrylic as the base. NO more embarrassing toenails that prevent you from wearing your sandals this summer. Give us a call and let's get your feet Summer ready! (919) 621-7027. **The pictures, made available, are from a recent service that was provided to a client that wanted a sculpted nail applied to her big toe to add length and width. parties outside of the local: Raleigh, Garner, Cary and Wake Forest areas.